You cannot cook up a more unlikely duo. 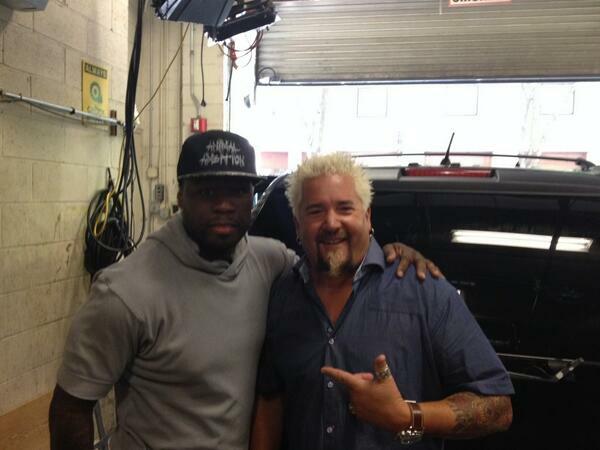 We all know how much Guy Fieri likes to point at things in pictures. Well, Guy just outdid himself because he ran into 50 Cent backstage at LIVE with Kelly and Michael. Luckily for us plebes, he captured this ~ candid moment ~ with him pointing his finger at 50, natch. You can clearly see that he is zapping Fiddy with his powerful "Bro Rays" via his magical "Bro Ring." If you analyze Fiddy's facial expression, it seems to be WORKING. Keep pointing, Guy. Keep pointing.